Do you want to teach like Jesus, the master teacher? 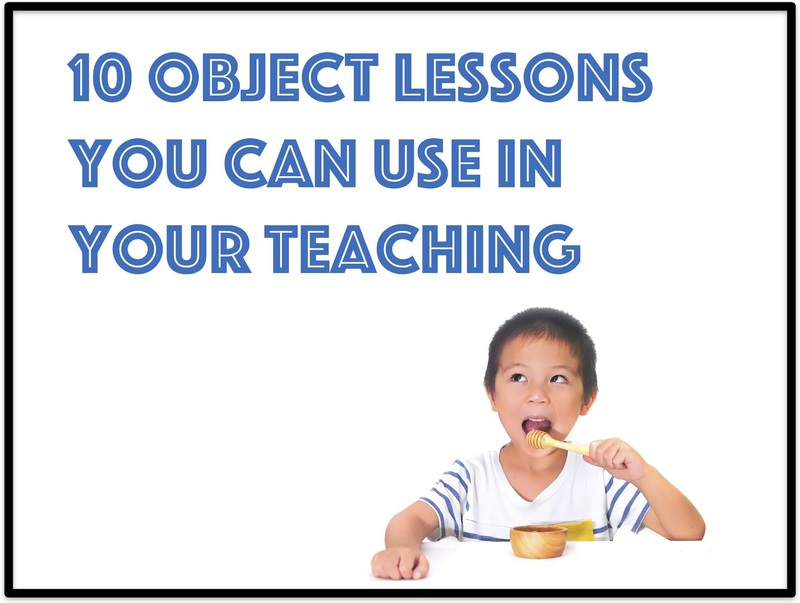 Then you should include lots of object lessons in your teaching. Think about all the times Jesus referred to objects in His teaching. Object lessons help you capture kids' attention and helps them grasp the Biblical truth you are sharing. One important thing to remember - as much as you can, use objects that are part of children's every day life. Why? Because it will help them remember the truth each time they see the object. This helps the truth make the jump from short-term memory into long-term memory. Here are 10 great object lessons you can use. One way street sign. Make a one way street sign. Use it to explain that Jesus is the one and only way to eternal life. Read John 14:6 with the kids. Afterwards every time kids see a one way street sign, they will be reminded of the truth. Video game system. Show a game that requires kids to go to a next level. Read 2 Peter 3:18 and remind kids that God wants us to continue to grow and get to new levels in our journey with Him. Tell them to think about this each time they are playing a game that has them go to a new level. Lunch box. Show the kids a lunch box. Share with the children about the story of the boy who gave his lunch to Jesus and watched Him do a miracle with it. Tell them that Jesus can do miracles with their life as well when they give themselves to Him. The story of the boy and the lunch is found in John 6:5-13. Encourage kids to remember this truth each time they open their lunch box. Tell them they can whisper a prayer to Jesus and tell Him everything they have, they place in His hands. Cell phone. Read Mark 11:24 with the kids. Talk about prayer and how God loves to spend time with us. Remind them that God will answer their prayers. Encourage them to whisper a prayer to Jesus each time they use a cell phone. Bird. If possible, bring a live bird in a cage. If not available, bring a large picture of a bird. Read Mathew 6:26-27. Share with the kids that God has promised to take care of them. If He takes care of the birds, how much more does He take care of us? Banana. Did you know you can use a banana to teach kids about the trinity? Peel the banana and break off the top part so the banana is even. Take your thumb and gently push down on the top of the banana. It will break into 3 parts. Explain how it's a reminder of the trinity. Tie it in with 1 John 5:7. Each time the kids eat a banana, they can be reminded that God is three in one. Candy Cane. This is a popular object lesson - especially at Christmas. Pass out candy canes. The white presents Jesus was sinless. It also represents how Jesus sees us when we accept His forgiveness. The red stripes represent the stripes Jesus received when He was being beaten for our sins. The hardness of the candy represents Jesus being our rock. The hook shape reminds us that Jesus is the good shepherd. Turn it upside down and you'll see it forms the letter "J" which stands for Jesus. Each time the kids see a candy cane, they can be reminded of what Jesus did for us. Tooth paste. Take a tube of tooth paste. Have the kids squeeze all the tooth paste out of the container. Ask how hard it would be to put the toothpaste back in the container? Remind them to use their words wisely. Once you say something, you can't take it back. Use Ephesians 4:29 with this and tell the kids each time they brush their teeth to remember this. Skateboard or bicycle. You can use this to teach the kids what it means to repent. Repentance is like when you are riding your bike or skateboard and you decide to turn around and go the opposite direction. That's what you do when you repent. You are going your own way, doing your own thing and then you turn away from sin and you follow Jesus instead. Ask kids to remember this each time they make a turn on their skateboard or bike. You can use Acts 3:19 with this. Pencils. Take one pencil and have a child break it. Next take a big bundle of pencils and see if the kids can break it now. They won't be able to. Explain that this is a reminder that God gave us the church so we could be stronger together and work together to do great things for Him. Read Hebrews 10:25 together. Your turn. What are some of your favorite object lessons? Share them with everyone in the comment section below. WOW, I have a hundred at least. One of my favorite is letting kids know how the items they use at school every day relate to God! Write things down God has done for you, they built altars to remember in the old covenant. Sometimes God may seem far away, go back to the notebook and read when he did things for you. I am the unKnown above talking about how school relates to God using the school objects.